Hola Amigas! Happy Saturday. Here in Jersey we have BEAUTIFUL weather. We are off to my sister's soon for a BBQ. Well I have to tell you that you will not be disappointed with the new Idea Book & Catalog. Lots of new and FUN additions. I am glad that they are now offering a fabric line...One of my many new passions! 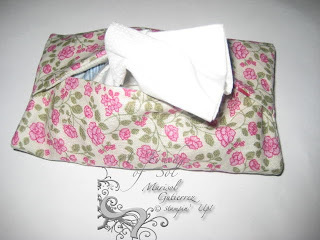 Here is what I made recently with our SU fabric. My first is a luggage tag. 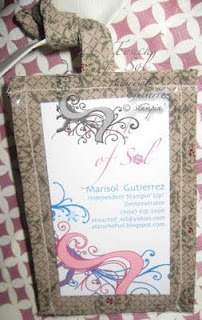 The front also has a vinyl layer so you can slip in your business card or you personal info...Cute, huh? How cute would this be on your convention bag? OMG this is so cute. I just downloaded the pattern how to make both of these a few days ago. Did you use clear vinyl? if so where did you find it at? I was thinking of making the luggage tag for my convention bag.